notion; but that Day is always with us. Redeemed or a Present Day Transition Reality? Franz Kafka (1883-1924) was a German-speaking Bohemian Jew, born and raised in Prague, and perhaps best known for his visionary novels depicting the anxieties and alienation with which many individuals and groups struggled as a result of the negative stigmas attached to them by "the mainstream" of society. He was, and for many still is, the voice and the conscience of the oppressed, whether that oppression be from tyranny within a family (which he experienced at the hands of his own father) or within a nation (as was felt by many Jews in various locations). His personal experiences provided a powerful empathic foundation for his writings, and his works are oft quoted. One of his statements that particularly appealed to me as I was studying for this present article is: "Only our concept of time makes it possible for us to speak of the Day of Judgment by that name; in reality it is a summary court in perpetual session." The existentialist French philosopher and novelist Albert Camus (1913-1960), whose writings I studied in some of my philosophy classes at the university I attended, agreed with Kafka in principle. Camus wrote, "I shall tell you a great secret, my friend. Do not wait for the last judgment. It takes place every day." Most of us have been taught for most of our lives that "Judgment Day" is an event that occurs "at the end of the world," and that all people will stand before the Throne, their deeds will be carefully examined, and then a judgment will be rendered as to their eternal salvation. Until that day comes, we are told to live our lives as obediently as we can to God's Law, and then just "hope for the best" when He determines if we did enough in this life to gain entrance into His presence. I can remember my maternal grandmother telling my sister and me (when we were just little kids) that there would be a huge "movie screen" on Judgment Day, and every good and bad thing we ever did will be shown on that screen for all the world to see (so we had better behave). Too many Christians, I fear, are of the opinion that none of us can truly KNOW, while we still live here on earth, whether we are saved or not. We "hope" we are, but we won't "know for sure" until we hear God's pronouncement on "Judgment Day." Thus, many disciples of Christ live in absolute fear, for they have no "blessed assurance" of salvation. Why? Because they are not sure if they have done enough or been good enough to make it. When I was living and preaching in Germany, back in the early 1980's, I quoted the following passage in a sermon: "God has given us eternal life, and this life is in His Son. He who has the Son has the life; he who does not have the Son of God does not have the life. These things I have written to you who believe in the name of the Son of God, in order that you may know that you have eternal life" (1 John 5:11-13). I stressed that we may KNOW that we are saved right now. A woman came up to me afterward and said this was the most arrogant thing she had ever heard. "NOBODY knows if they are saved or not," she declared, "and they WON'T know until Judgment Day." If our salvation is knowledge-based and performance-based, then she may have a point. How do we know if we KNOW enough, or if we are DOING enough, to receive a "passing grade"? What percentage of religious correctness is required for salvation? Legalism fosters such fears, but love and grace remove them entirely. The aged apostle John informs us that when we abide in the loving embrace of our Father, that mutual love for one another casts out fear, and we may have "confidence in the day of judgment" (1 John 4:17-18). Our eternal salvation is a free gift: extended by grace, received by faith. It has nothing to do with any act we may perform or regulation with which we might comply. Salvation is faith-based. If you believe, then you may know!! By accepting His gift of grace in faith, you are accepted by Him; you are saved; indeed, you are judged already. For you, the Day of Judgment has no real impact, other than to usher you into that fuller life in the new heavens and earth. For you, the day of Christ's return will be for the purpose of gathering you to His bosom, not for the purpose of judging. By grace through faith you have already been judged, just as those who reject His grace have already been judged. When Christ returns it will be to bring both eternal reward and punishment, not to have a huge trial. John tells his readers (and, by extension, us as well) that "we know that we have passed out of death into life" (1 John 3:14). This is something we, who are in Christ Jesus, KNOW RIGHT NOW. The transfer has taken place; we have transitioned from death to life. It is done! It was done when we believed. By grace through faith we have been judged already. Notice the words of Jesus: "He who believes in Him is not judged; he who does not believe has been judged already, because he has not believed in the name of the only begotten Son of God" (John 3:18, NASB). Jesus continues, "Truly, truly, I say to you, he who hears My word, and believes Him who sent Me, has eternal life, and does not come into judgment, but has passed out of death into life" (John 5:24, NASB; the NIV reads, "has crossed over from death to life"). Some need to seriously rethink their "Judgment Day" theology, for they are perpetuating a spirit of uncertainty within the hearts and minds of those who, by faith, have already crossed over from the realm of darkness and death to the realm of light and life. This is a reality that we may know now! So, why do some continue to insist that this view is false? Because it takes away their law/works-based theology, and this is something no legalist can abide. It places salvation in God's hands, not ours, and such grace they simply cannot grasp. "There is an egocentricity in each of us that constantly insists I can work out my own salvation. It is the cross, the lifting up of the Son of Man, that finally unmasks this ego" for what it truly is [Dr. Roger L. Fredrikson, The Communicator's Commentary: John, p. 86]. The above statements from both Jesus and John are pretty straight-forward, but let me share a number of insights from biblical scholars on these passages that may make this truth even more convincing. With respect to the verb forms used above, where Jesus says the believer in Him "has" eternal life, and he/she "has" passed out of (or crossed over from) death to life, the Greek scholar Dr. Marvin Vincent states, "to such a one, eternal life is not merely something future. It is a present possession. He hath it" [Word Studies in the New Testament, vol. 2, p. 109-110]. Another noted Greek scholar and biblical translator, Dr. B. F. Westcott, writes, "The passage has been made: the new sphere of being has been gained. Life is not future but present" [The Epistles of St. John, p. 112]. Drs. Jamieson, Fausset and Brown say this is something we "know as an assured fact" [Commentary Practical and Explanatory on the Whole Bible, p. 1505], for the believer "hath everlasting life immediately on his believing" [ibid, p. 1037], "having immediately on his believing 'passed from death unto life.' What a transition!" [ibid, p. 1031]. "To pass over from one place to another; to migrate out of death into life, and so no judgment. We have already done it while here on earth" [Dr. A. T. Robertson, Word Pictures in the New Testament, e-Sword]. "The believer in Christ as Savior does not come into judgment, for trust in Christ prevents condemnation, for He takes our place and pays the penalty for sin for all who put their case in His hands" [ibid]. Thus, he "now has this spiritual life" [ibid]. As the apostle Paul emphatically asks, "Who will bring a charge against God's elect?" (Romans 8:32). We have been justified by the Lord, "therefore there is now no condemnation for those who are in Christ Jesus" (Romans 8:1). Our case has already been settled; Jesus paid the price in full; there is no need for a trial or judgment. Judgment for the believer has already occurred. It occurred at the cross, and all who embrace that grace by faith have even now passed from death to life in Him. Matthew Henry (1662-1714) rightly observed that "the tenor of the first covenant was 'do this and live,'" whereas "'believe and live' is what we may venture our souls upon" under the new covenant [Commentary on the Whole Bible, e-Sword]. "Can any believer in the Lord Jesus doubt his eternal salvation with words like these before him, words that come to us directly from the lips of the Son of God Himself?" [Dr. H. A. Ironside, Addresses on the Gospel of John, p. 197]. "If you believe what God has said, our Lord declares that you have eternal life. Now notice, it is not that you may hope to have it ... It is not eternal life at the end of the way. It is the present tense: 'He that believeth hath.' ... There is no judgment to those who are in Christ. Why? Because all our judgment was borne by the Lord Jesus Christ when His arms were outstretched on the cross. There all that our sins deserved was poured out upon our blessed Substitute, and so we shall never have to go into the judgment for our sins. Our Judgment Day was at the cross. All our sins were dealt with when He took our place upon the tree, and so we shall not come into judgment, but already we have passed out of death into life" [ibid, p. 198-199]. "The Son is the arbiter of destiny. The determination of this destiny is immediate (John 5:24). Eternal life becomes the possession of the believer at the moment of acceptance; the future 'judgment' will only confirm what has already taken place. The assurance of salvation does not begin at death or at a future judgment. 'He has crossed over' is in the perfect tense, which indicates an accomplished transit and a settled state" [The Expositor's Bible Commentary, vol. 9, p. 65]. 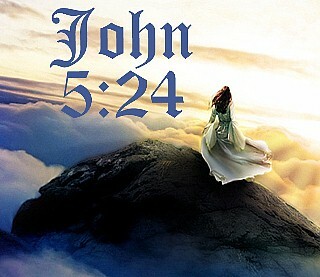 "Jesus having come, He has provided that through faith in Him man might come to God and be saved. So those who believed in Him were not under judgment" [David Lipscomb, A Commentary on the Gospel According to John, p. 50]. When we seek to elevate traditional sectarian practices and party preferences to the level of law, declaring that one can not be saved unless they comply with our perceived religious patterns, then we have shown complete ignorance of God's redemptive purpose! Salvation has nothing to do with the particulars of a "worship service," although many of these particulars have been invested by men with "redeeming power." DO THIS and live, they cry. How pitiful, when the only redemptive power in the universe is right before them in the person of God's Son. COME TO ME and live, He pleads. Jesus made it very clear that if we will accept God's gift of grace by our sincere faith, then we shall be united with Him in an intimate spiritual relationship that transitions us from death to life, and in so doing removes us from the judgment to come! Our journey from that point forward will be characterized by one thing: LOVE. As He loved us, so we shall love the Lord God with all our being, and our neighbor as ourself. BY THIS all men will know we ARE His children; we ARE saved; we HAVE eternal life. How do we KNOW we have passed from death to life? How do we KNOW we are secure in our salvation RIGHT NOW? By this LOVE!! So says the apostle: "We know that we have passed out of death into life, because we love the brethren. He who does not love abides in death" (1 John 3:14). All your religious traditions count for nothing in God's redemptive plan!! "All external worship, all pretense at prayer, all church-going, all conversing of God and things divine, will avail nothing whatever: he that has no true love and gives no evidence of true love will remain in death" [Dr. Paul E. Kretzmann, Popular Commentary of the Bible: the NT, vol. 2, p. 569]. Matthew Henry (1662-1714) describes this love as a distinguishing mark of our justified state. "It is not a zeal for a party in the common religion, or an affection for, or an affectation of, those who are of the same denomination and subordinate sentiments with ourselves" that marks this state of justification, but rather this LOVE [Commentary on the Whole Bible, e-Sword]. Let me close with the words of a leader within my own faith-heritage: Guy N. Woods, whose following comments are a challenge to us all: "Just here care should be exercised in avoiding an obvious and common misinterpretation of this text (1 John 3:14). It is not the apostle's purpose to affirm, nor did he affirm, that love of the brethren is the (or even a) condition of salvation from past, or alien, sins. Brotherly love is here declared to be the condition, not of our salvation, but of the certainty of our knowledge of it. It affords the evidence by which we may know that we have passed out of death into life. 'We know that we have passed out of death into life because...' -- we have been baptized? Because ... we meet on the first day of the week? Because ... we give liberally of our means? Because ... there is outward conformity to the ceremonials of Christianity? These are not the tests which the Lord ordained. 'By this shall all men know that ye are My disciples, if ye have love one for another'" [A Commentary on the NT Epistles of Peter, John and Jude, p. 278]. I fear there are many of my fellow disciples who have become so focused on religious ritual that they have lost sight of spiritual relationships in the ONE BODY of our ONE LORD Jesus Christ. They may "pass the test" on LAW, but they have "failed the test" of LOVE. To these misguided ones I would simply say: Judgment has been crossed out at the Cross for those who believe, and we have crossed over from death to life. By His grace we are saved; a gift we receive right now by faith. It is ours, and we show our gratitude by loving you as He loved us: unconditionally. Come journey with us, and let us together show the world what Christianity really looks like! Your ministry has been of great benefit to me for many years! I refer to your Reflections articles nearly every week. However, until recently I did not know of a way to conduct a word search for a specific word or topic in your body of work other than using your Topical Index and/or your Textual Index. The method I have discovered is to go to Google, then type in a topic word or phrase followed by the link to your web site. For example: Lord's Supper:http://www.zianet.com/maxey/ will bring up a listing of Reflections article numbers dealing with this topic. If there is a better way to find specific articles on a particular subject, please let me know. Thanks again, Al, for your outstanding work! Greetings in Jesus. I trust you are having a restful time over Christmas. I have sent you a postcard which you should receive soon: something from New Zealand. When I saw it, I thought of you. We are so thankful here for your exhaustive Reflections studies throughout the years, and we pray that 2018 may be even better and richer!! Your last article, "A Stunning Self-Disclosure: The 'I AM' Reveals 'WHO I AM' - A Reflective Study of Exodus 34:6" (Reflections #738), is yet another great article! One of the problems some people have with the Old Testament is that they fail to recognize that it is as much about the nature of man as it is about the nature of God, and there is a lot about man that is not good, as was evidenced in Genesis 6. Another thing that seems to be problematic to many is that the Bible is a gradual revealing of God's purposed plan from eternity (Ephesians 1:3-12). God is always God; faith is always faith; righteousness is always righteousness. Nothing has essentially changed. We have an unchangeable God, who had an unchangeable plan from eternity, and that plan was realized in a Man: JESUS (Acts 2:23). Al, may you and Shelly, and all your family, have a blessed Christmas! Al, my brother, in evaluating your current Reflections ("A Stunning Self-Disclosure"), I'm reminded of our late brother W. Carl Ketcherside, who addressed this topic by saying that God has dealt with humanity, extending His love and grace, in three growth stages: (1) The Childhood Stage: prior to the Law, (2) The Adolescent Stage: the Law, and (3) The Adult Stage: the maturity stage; the period of grace, faith, mercy and compassion. I think Ketcherside was correct, and in this issue of your Reflections you have given attention to this concept, but by employing a different approach. I agree with your approach, as I also agreed with Ketcherside's approach: both of you are telling the same story! Yes, God displayed His love and grace during the first two stages of humanity's growth (as with Noah, which you dealt with in Reflections #737: "Grace and the Noah Narrative"), but He did so by degrees. In the first two stages, He functioned as a disciplinarian, or "schoolmaster," in order to bring us to the state wherein we now reside, wherein we "graduate." What a wonderful and delightful "schoolmaster" He has been through the ages! Praise His name forever! Carry on, my dear brother!! LOVED IT!! -- "A Stunning Self-Disclosure." Good insight: your mention of how a parent comes across differently to his/her children at different stages in their lives. Reminds me of a funny and true story. The Sunday School teacher was beginning class with a brain-storming question: "When is capital punishment justified?" A woman answered immediately: "When your children are really, really obnoxious!" Every parent can relate to this! I was doing some research on another topic the other night and realized, incidentally, that Scripture many times says, "And God had compassion on them." He would punish, then redeem! The Israelites didn't "work" themselves out of trouble; rather, God had compassion on His kids and sought to redeem them from their self-destructive behavior. That's GRACE. Unmerited favor. I'm really glad you followed up your Noah article with this one ("A Stunning Self-Disclosure"). It "seals the deal." I'm not sure why some want to earn something that is impossible to earn!! Not one person has ever earned their salvation. Perhaps if a generation or two had done so, then we would have an example. But NONE have! Have a great Christmas, my friend. I was thrilled to read your current article ("A Stunning Self-Disclosure") where you articulated almost thought-for-thought the conclusions I reached regarding Exodus 34:6-7 in my own personal search for a greater understanding of God's grace. This Self-disclosure from Almighty God has been the basis for my greater enlightenment on issues such as MDR, Unity in Diversity, the Nature of Man, etc. God's proclamation that "He Who Is" is "...merciful and gracious, slow to anger, and abounding in steadfast love and faithfulness..." has given me peace of mind and filled me with great joy, because this is the character/heart of my Father in heaven. It has closed the loop for me in regard to the God of the OT and the Son of God of the NT. "Grace and Truth came through Jesus Christ." Thank You, Al. Al, you wrote, "God is so full of love and mercy and grace that He continues to reach out to those who desire to be in relationship with Him, even though they are each pitifully flawed." Wow, can I ever relate to that statement! Also, you wrote, "Our gracious God bestows His unmerited favor on those who have no claim whatsoever on it." Indeed! Without His unmerited grace and favor we would have NO chance to enter the coming Kingdom. I greatly appreciate all you do, brother. May our amazing God be your strong tower and sure defense, and may He continue to give you the wisdom to move forward, following the guidance of His Spirit, in the way He wants you to go! Your brother in the Lord Messiah. Al, I continue to be amazed with each subject you present in your Reflections and the information you provide. Also, the comments of the "Reader in Texas" (in your last readers' section), who was concerned with his 10-year-old son who wanted to be baptized, I can completely understand. Our oldest was also 10 when he wanted to respond. I did not object, because he truly wanted to be saved. His understanding wasn't as good as mine at the time, but then I too had some blanks in my understanding before my own baptism, even though I was in my teenage years when I responded. I am of the opinion that we are not to sit in judgment of who God adds to His Son's Body. I know there can be extenuating circumstances that would indicate a need to refuse someone's request to be baptized (e.g., they were drunk, on drugs; they confessed they were only doing it to please spouse, parents, girlfriend, etc.). On another note, I couldn't help but be amused by the title of one of your articles to which you referred this reader in Texas: "Toddlers at the Table: The Doctrine of Paedocommunion" (Reflections #316). First, I had never heard of that word before. That's my own limited knowledge showing up! Second, I actually had to look it up to see if it was a "real" word. My apologies for doubting your scholarship!! Third, I had this thought: as far as inspiration is concerned, neither young nor old, nor even real young, "waited on the table." The "table," as we know it today, and which we think must be located "in the sanctuary," wasn't even a first century piece of "church furniture." I guess I could always "Google" to try and find out if anyone in history is identified as the first "Lord's Table" maker ... but, on second thought, I think I'll pass!! (LOL) Again, thanks for all your work!! My dearest friend, there is no end to my gratitude toward you for helping me find some answers when I didn't even know the questions!! Before I had gotten very far into your new book "From Ruin to Resurrection," I was overcome with tears and relief to know that finally I was going to receive the truth, understanding and clarity on this subject that I couldn't find for so much of my life! I am coming to realize that I was a Conditionalist without ever hearing the word before! NOW, things make sense! Thank you for this signed copy of your book. It is a precious treasure to me!! All my thanks, hugs and love always!